Dramatically improve your smile in a single visit with office dental whitening. Your smile is one of the first things people notice. A brighter, whiter smile is beautiful and can help you feel better about yourself. A smile can often be improved by simply whitening teeth that have become stained and yellowed over time. Zoom in-office whitening can change the color of a smile eight shades of white in an hour. At-home whitening can help keep that smile white. Office whitening and home whitening gel provide temporary results that require maintenance to keep your beautiful white smile. Dental whitening and home bleaching gel are often used together. 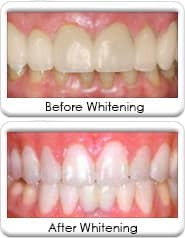 Home teeth whitening - changes teeth color up to 6 shades of white in a few weeks. The home whitening method will produce results almost as good as the In-Office whitening treatment. Not all teeth respond the same way to bleaching. Some teeth may be stained deep below the surface. Dental laminates or porcelain veneers can provide patients with a permanent dental whitening alternative. A dental consultation is the first step in achieving your goal. During your consultation, Dr. Clausen will explain which method is most likely to meet your goals. Dr. Clausen uses Zoom®, one of the most advanced whitening systems available. Home whitening can lighten your teeth up to 9 shades over time. A custom-fit mouth tray holds professional strength whitening gel around each tooth. The professional strength whitening gel agent is several times stronger than an off the shelf brand.